The Bachelor Expert: Who Should be The Bachelor 17? Who Should be The Bachelor 17? It is that time of year again, when the next Bachelor is selected. 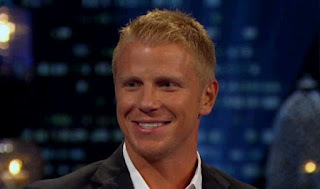 As of right now, it appears there are three candidates in the running, Sean Lowe, Arie Luyendyk and Roberto Martinez. People have extreme feelings about who they want it to be. Some have even said, "It has to be this person, or ....."
I really like Sean and Arie, and think Roberto is a great guy. They all have their pros and cons. I'm going to compare the three. Feel free to comment your thought below, but remember I have no part of the decision making. Sean at the Men Tell All. These guys are all really great. I think ABC should go with people who have been on the show lately, if they do not opt for someone new. Roberto's season was four seasons ago, and people were in love with the idea of him and Ali as a couple. He didn't appear to want to be in the spotlight. Tabloids have said it is him, but they have also claimed he has a girlfriend. ABC may want to stay on this track of taking people from a few seasons ago. If they go with someone from Emily's season, I see them asking Arie first, because I have never known them to not ask the runner-up. I cannot decided between Arie and Sean, so I think they should do a Double Bachelor. This could be set up in different ways. On the first night they could give the women roses and let them decide which Bachelor they want. They could also let each Bachelor choose 10 people, if they like the same people, it could get interesting. It would really give the contestants some control in who they want, if they had to choose which one to date. On the premiere, they could make them choose 10 or so women, and they could not be the same. Then the Bachelors would date their women. We could see one one-on-one from each guy, and a group date of them all. I think it could work. Some people want a new person, we don't know. It could be an interesting twist, but ABC has found an equation that works for him. They want someone who the audience is already invested in, and will be easy for production to deal with. Former contestants already know how things will play out. Who do you all want to be the Bachelor? I know you have an opinion. Comment below or tweet it to me @BachelorExpert. Mike Fleiss has been tweeting about how difficult the decision is, I wouldn't want to be in his place.